You begin by crossing the lake. 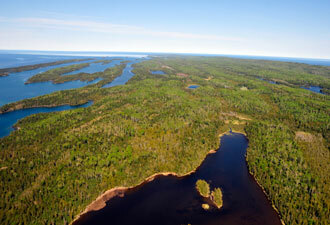 Isle Royale isn't the easiest place to get to, but that's just part of the adventure. Isle Royale National Park is an archipelago, including a 47-mile-long wilderness island, in Lake Superior, and it's well worth the seaplane or boat trip to reach it. Potential moose and wolf sightings…colorful orchids…stunning rock cliffs…a bracing swim in the biggest lake in the world—it's all here. Imagine climbing out of your sleeping bag in the morning to a dew-glistening world of firs and spruces, bright wildflowers, and the ever-present expanse of the lake. 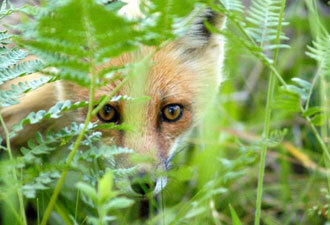 As you hike around Rock Harbor, exploring rocky coves, you might spot a red fox in the shadows. Perhaps you'll experience the thrill of startling a moose as she eats in Washington Creek. Picture yourself sitting quietly and watching the sun set in one of the world's most peaceful places, home to famous research, ten shipwrecks, four lighthouses, and its own subspecies of tiny red squirrel. This is where it happens. If you're a backpacker or a paddler, this is your place: remote and rugged, with surprises around every curve of the trail or lakeshore. The 165 miles of trails and 36 pristine backcountry campgrounds, most right on the water, make it easy to develop any itinerary: from overnight trips to two-week excursions, trips for beginners or seasoned experts. You can fall asleep in your tent (or one of our screened-in shelters) listening to the not-so-distant loon calls, and wake under a canopy of firs before hitting the trail or dipping your paddle into the clear water. 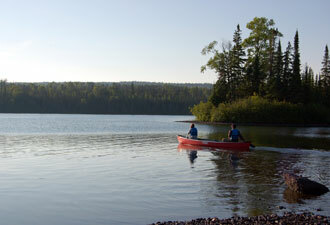 Acquaint your feet with our rocky paths or see the island from the viewpoint of a loon. The island is almost entirely designated wilderness, and it's yours to discover. Get out there. Sailing across from the mainland with your powerboat or sailboat is another popular option, and a spectacular way to explore the park. The big island and its barrier islands are ringed with reefs for fishing, docks and places to anchor for overnight stays, and quiet places to have a campfire and gaze at the stars. For divers, the park's shipwrecks beckon. Whether under the surface or riding the lake’s waves, you can explore new ground and get away from it all. Relax and enjoy. Rock Harbor, at the northeast end of the island, is a base camp for those less interested in lugging a tent over the trails. Stay in a Rock Harbor Lodge room or cabin, where you'll be no less graced by loon calls and can explore the area's day hikes or paddle routes: peering at pitcher plants at Raspberry Island's bog, looking for moose at Hidden Lake, or hiking the beautiful trail to Scoville Point. There are also two rustic cabins for rent on the west end of the island in Windigo, where one can explore peaceful Washington Harbor. The options are endless. You don't need to search hard for adventure and beauty on this island: it's impossible to miss. The entire park is a complex web of verdant life. There is activity for everyone and wildlife (from fox to otters to bald eagles) around every corner. Whether you stay for one sunny afternoon, or a week of sunsets, this place will change your life—and it all starts by crossing the lake.